A solid victory for the Western Bulldogs, built on the back of controlling the football and denying the Hawks the ball. The Dogs led uncontested possession by 59 for the match, and enjoyed almost five minutes more possession of the ball for the match. Aaron Naughton has made a solid AFL debut recording 12 disposals at 92 per cent efficiency, six contested possessions and an equalteam-high seven possession gains. Hawthorn has been well on top in inside 50s for the quarter, leading this area 11 to five. Despite this, they have just 1.4.10 to show for it and have been outscored by four points for the term. The Bulldogs have launched 6.7.43 from their attacking midfield zone, compared to just 1.3.9 by Hawthorn. As the match has worn on, the Bulldogs have been cleaner than the Hawks with the football recording a disposal efficiency advantage of 79 per cent compared to 74 per cent. After spending the entire second quarter on the bench, Lachie Hunter returned to the field and led the Bulldogs with eight disposals, four contested possessions and five inside 50s in the third term. The Bulldogs lead inside 50s 17 to seven for the quarter and have enjoyed 63 per cent time in forward half for the term. Marcus Bontempelli's class has come to the fore in this term. He has had seven disposals, six via a contested possession, two clearances and two inside 50s for the quarter. The Bulldogs have outscored Hawthorn 6.4.40 to 2.1.13 from intercept possessions. The Bulldogs are controlling the football this quarter, leading uncontested possession 33 to nine for the term. The Bulldogs have controlled the territory to begin the third term, enjoying 77 per cent time in forward half in the early stages of the term. The Hawks have kicked 6.2.38 from stoppages for the match to date, double the score of the Bulldogs' 3.1.19 from this score source. Tom Mitchell was the start of the first half amassing 18 disposals, 10 via a contested possession, six clearances, five inside 50s and four tackles. James Sicily shapes to be an important ball user out of the Hawks back half. He has eight disposals for the quarter at 100 per cent efficiency and has gained 234 metres for his side. 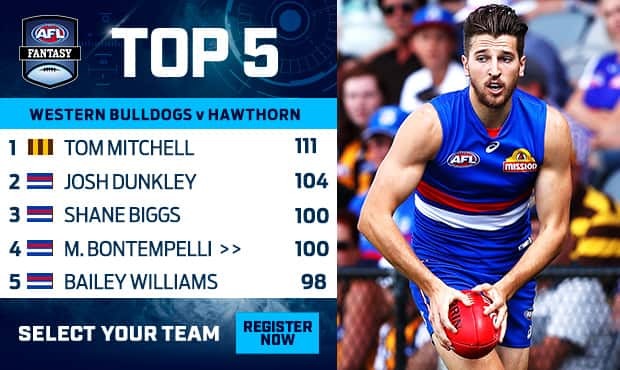 The Bulldogs have used the ball far better by foot this term, kicking at an efficiency of 85 per cent after going at just 60 per cent in the first quarter. 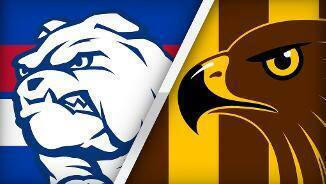 Hawthorn lead the Western Bulldogs 17 to nine in contested possession this quarter and 56 to 43 for the match. Tom Mitchell has eight contested possessions to lead the Hawks. Both teams did not using their full compliment of interchange players in the first term with Liam Picken and Josh Schache remaining on the bench for the Bulldogs and David Mirra and Harry Morrison remaining on the pine for the Hawks. Tom Mitchell has continued the prolific form he showed last year, with nine disposals at 67 per cent efficiency in the opening quarter. Last season, Mitchell led the competition with an average of 36 disposals per game. Both teams have scored freely in the opening term, particularly from stoppage chains. Hawthorn has kicked 4.1.25 from this score source, with the Bulldogs kicking 3.0.18all as a result from throw-ins. Jack Macrae has had an outstanding first term with eight disposals at 88 per cent efficiency, three contested possessions, three tackles and two goalsequalling his goal tally from last season. Hawthorn regains the lead through Luke Breust. Three of Hawthorn's four goals have come via stoppage chains. By contrast, three of the four Western Bulldogs goals have come via intercepts. The Bulldogs have recorded a kicking efficiency of just 52 per cent so far in the match. Hawthorn is travelling far better by foot, kicking at an efficiency of 69 per cent. Hawthorn is beginning to get it's game going, leading uncontested possessions 20 to 13 and using the ball at 77 per cent efficiency compared to just 59 per cent from the Bulldogs. The Bulldogs are hunting the Hawks well at this stage, leading the tackle count 11 to four. Josh Dunkley kicks the opening goal of the match for the Bulldogs. He has both the Bulldogs' inside 50s thus far. Last season, 34 per cent of Hawthorn's total possessions were contested, the lowest percentage of any side.The Hawks won the contested possession count in just seven matches last season. The Hawks went at a kicking efficiency of 70 per cent last season, ranked No.1 in the competition. The Western Bulldogs played on from a mark 37 per cent of the time last season, ranked No.1 in the AFL. They also averaged 189 handballs per game last season, ranked second, showing their intent to keep the ball in motion. 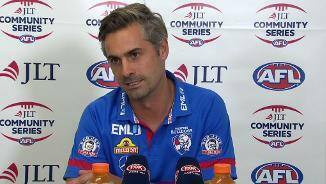 THE WESTERN Bulldogs have given their fans hope that last year was an aberration, downing Hawthorn by 22 points in their JLT Community Series clash in Ballarat on Saturday afternoon. After a see-sawing first half on Saturday, the Dogs broke away in the third quarter to prevail 15.10 (100) to 11.12 (78) in front of 4565 fans at Mars Stadium. Looking to bounce back after missing the finals last season for the first time since 2009, the Hawks led by 10 points at half-time but could only manage three goals in the second half. The slick Dogs piled on five goals in the third term but lost veteran forward Liam Picken to concussion late in the quarter. Picken was stretchered off after being knocked out in a collision with teammate Josh Dunkley. "He doesn't know any other way, Picko. He's just full on and wants to make a contest," stand-in coach Daniel Giansiracusa said. "We'll assess him throughout the week so, hopefully, he's all okay but at least he was up and about after it." It was otherwise smooth sailing for the 2016 premiers, who had plenty to prove after limping to a 10th-placed finish last season. 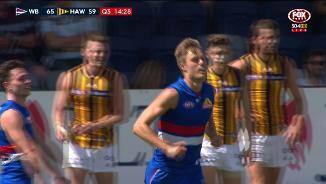 Key forward Josh Schache sat out the first half but didn't take long to make an impact, linking up with Jason Johannisen to boot his first goal in Bulldogs colours early in the third term. Tough midfielder Tom Liberatore, who struggled to keep his spot in the side last season, was solid with 18 disposals and a goal. Both sides fielded near full-strength teams for their first trial match of the off-season, with Cyril Rioli, Grant Birchall and James Frawley among the notable omissions for Hawthorn. The Hawks had the better of a first half in which the lead changed hands a dozen times. Former Port Adelaide recruit Jarman Impey displayed his blistering speed in an impressive first quarter, finishing the match with 15 disposals and six inside-50s. Fringe key forward Ryan Schoenmakers slotted three goals while Tom Mitchell (30 disposals, 10 clearances) was typically prolific at the coalface. Jaeger O'Meara finished with 16 touches but showed plenty of class and didn't appear to be restricted by the knee issues that kept him to just six games last season. And Hawks fans would have relished seeing the blistering speed on display from Port Adelaide recruit Jarman Impey. "He's going to be pretty electric for us," coach Alastair Clarkson said. "He'll provide a pretty potent forward line when Cyril returns with (Paul Puopolo) and Lukey Breust." Western Bulldogs: The Dogs' stars can fix their forward issues. Last year the 2016 premiers struggled going inside 50 with their efficiency and weren't much better with their conversion. Against the Hawks they used superstar midfielder Marcus Bontempelli predominantly forward in the first half and he dominated, with Jack Macrae and Jason Johannisen also dangerous while roaming around inside 50. That sort of quality certainly made the forward structure far more potent. Hawthorn: The Hawks' small forwards will give opposition defenders nightmares this year. 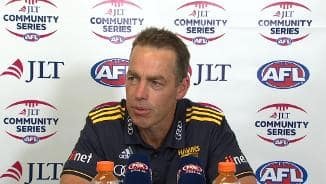 The tackling pressure of Cyril Rioli, Paul Puopolo and Luke Breust is already well known, and the addition of former Port Adelaide speedster Jarman Impey has given the side even more spice at ground level. Backmen beware. Western Bulldogs: The Dogs gave their top draft pick a good taste of senior footy with Aaron Naughton starting deep in defence. The West Australian rotated on a number of opponents including Jack Gunston, Jarryd Roughead and Ryan Schoenmakers and look composed with the footy. Hayden Crozier was solid in defence with his sure ball handling, while Jackson Trengove was a strong presence both in the ruck and as a key forward. Josh Schache only played the second half, but did some handy work in the ruck and kicked a goal. Hawthorn: Former Port speedster Jarman Impey started well inside 50 but went missing during the middle stages of the match, before adding some more impact in the final term. Mature age draftee David Mirra spent the first three quarters on the bench but finally got a run in the last term. The 26-year-old didn't have a big influence but used the ball neatly in the back half. The Bulldogs return to country Victoria for the second week running to take on Collingwood in Moe on Saturday afternoon, while the Hawks head to Launceston to host Carlton later that night.